﻿Yangshuo is a stunningly beautiful countryside holiday destination of China which attracts tourists from worldwide. Its amazing beauty is experienced best by bicycling your way through the mess of karsts Limestone Mountains, lazy rivers and ancient Chinese villages. Biking or bicycling is one of the major activities offered here since 1980’s, simply because it is a cycling paradise with countless village traits and some of the most unbelievable sceneries of South China. A bike can easily be hired here. 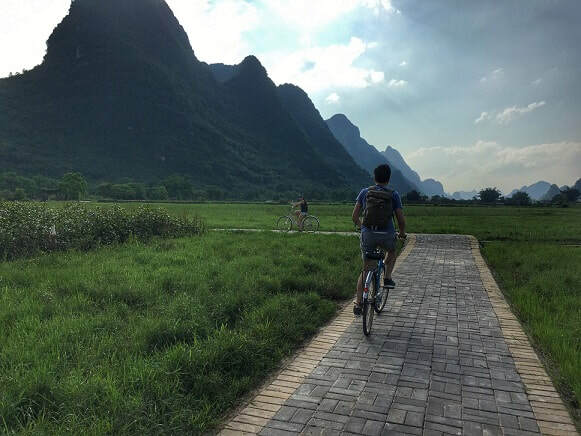 Cycling for just about 15 minutes in many directions from the main city of Yangshuo takes you to entirely picturesque settings of the countryside. There are four most popular bicycle routes. Each can be covered within half a day of full day depending on your pace. The Yulong River Short Route- This classic route of 15 km encompasses verdant karst hills, rivers, small villages, rice paddies and scenic spots. The Yulong Village Countryside Route- This route from Yangshuo takes to national Road 321, a list of tourist attractions to Moon Hill from where you pedal through a series of small villages nestled among the Karst hills and rice paddies. The Baisha and the Yulong River Route- This route not only offers cycling but bamboo rafting as well. The Fuli and Xingping Route- this is the longest bike ride route with the most beautiful stretch of the Li River. Interested in Cycling in Yangshuo on a Tour? Wendy Wei Tours offers a variety of different packaged tours as well as custom tours including Yangshuo Cycling, among other attractions and destinations. To find out more, please visit our Tours page or Contact Us directly to find out more.